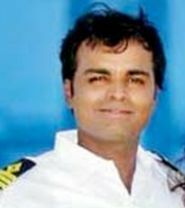 India on Tuesday said it is in touch with Togo authorities to secure on compassionate ground the release of a jailed Indian sailor even as his family met the prime minister requesting his intervention to ensure the seaman is able to conduct the last rites of his 11-month-old son. "We are in touch with them. We are trying to do our best. Let’s hope for the best. This is a human tragedy," External Affairs Minister Salman Khurshid told reporters at the sidelines of a CII function. The family members of merchant navy captain Sunil James, jailed in Togo, met Prime Minister Manmohan Singh in his Parliament House office seeking his early release. According to reports, the sailor's 31-year-old wife Aditi and others in the family want James to conduct the last rites of his son whose body is lying in a hospital morgue since the toddler's death from septicaemia on December 2. Indian officials from Accra also met the sailor, whose family eagerly awaits his return for performing the last rites of his son. Captain James is under arrest in the west African country Togo since July on the charge of aiding pirates who had attacked and looted his Marshall Islands-flagged MT Ocean Centurion on July 16. What do Goans THiNK of Tarun Tejpal?